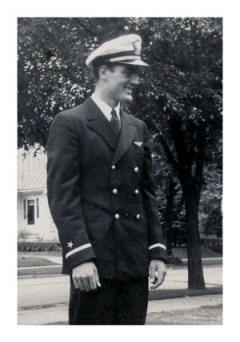 Ed Scharch wearing Ensign uniform in front yard of Milwaukee home ca. July 1944. Photo taken around time of carrier qualification in Chicago. Ed's personnel records are incomplete and lack any mention of the operational flight training he experienced. Most likely, he was sent to NAS Jacksonville and would have arrived after completing Intermediate at Pensacola in March 1944. Records obtained from the National Personnel Records Center (NPRC) on August 12, 2002, show 379 days unaccounted for between dates of Ed's graduation at NAS Pensacola on March 14, 1944, and his eventual discharge from the U.S. Navy on March 28, 1945. Despite missing records it is possible to sketch out Ed's experience with operational flight training - based on naval aviation history, and the personal accounts of many other Navy pilots as well as Ed's. According to Hill Goodspeed, historian at the National Naval Aviation Museum in Pensacola Florida, Ed would have been sent to the Operation Training Unit (OTU) at Naval Air Station Jacksonville in Florida. It took about three months of training in Jacksonville, FL before pilot trainees were sent to the Carrier Qualification Training Unit at NAS Glenview, Illinois for the final phase of OT. Aircraft carrier (CV) pilots were required to make eight landings and take offs from one of the two training carriers that operated year round, seven days a week on Lake Michigan. Student officers fresh from intermediate training, like NATC Pensacola's, arrived at Jacksonville and other operational training activities for the final instruction that prepared them for the Fleet. 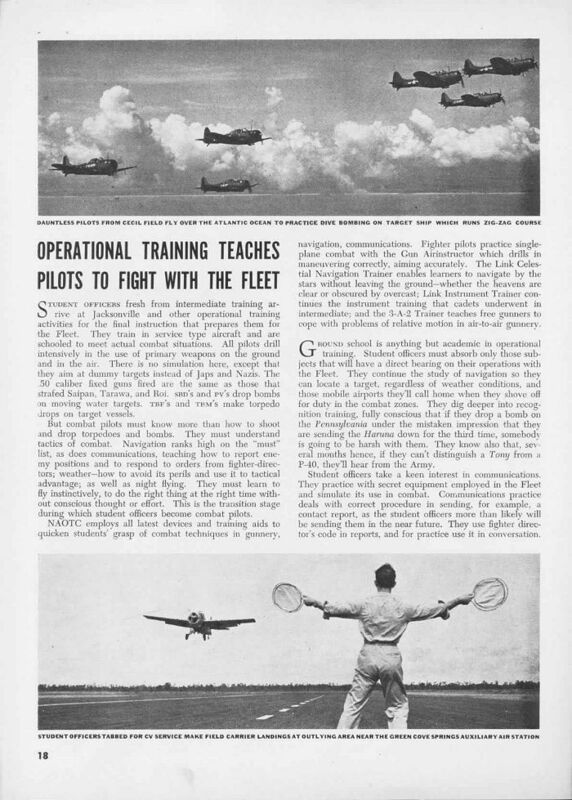 A back issue of Naval Aviation News, dated September 15, 1944, described Jacksonville as a "Postgraduate School of Naval Aviation." The operational training unit is where Naval Aviators, air and ground crewmen received their final instruction before assignment to squadrons in which they flew and fought against the enemy. At the time, Jacksonville's main station covered about 3,200 acres, and outlying activities made up more than three times as much additional territory. 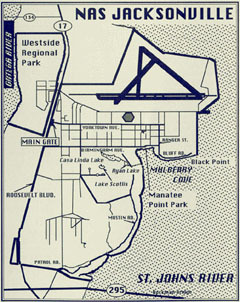 Major units under the jurisdiction of NAOTC Jacksonville included Aircraft Delivery Unit, A&R Shop, Supply Depot, all no "main side"; boat facility and auxiliary air station at Mayport; Naval Air Gunners' School at Yellow Water; NAAS Cecil Field; NAAS Green Cove Springs; NAAS Jacksonville Municipal Airport No. 1, and a number of auxiliary air facilities and landing areas within a 50-mile radius. 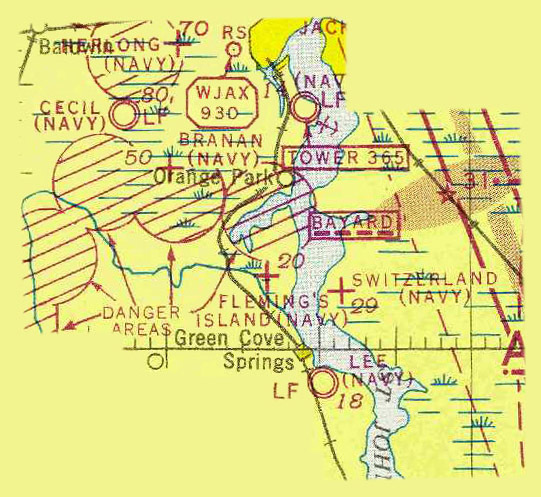 Auxiliary air stations at Cecil Field, Green Cove Springs and Jacksonville Municipal Airport No. 1 were linked to NAS and accounted to NAOTC for the operational training of pilots. In 1939, Navy construction crews began building and carving NAS Jacksonville out of a semi-tropical wilderness of pine, oak and palm trees on the long-abandoned site of the Army's World War I Camp Johnston. The Navy commissioned the station on October 15, 1940 and pilot training commenced in January 1941. Naval aviation cadets were instructed in intermediate training until the establishment of the NAOTC in April 1942. The last class of cadets finished their intermediate course in January 1943. NAS Jacksonville comprised the largest single unit of NAOTC during WWII. 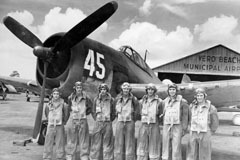 Battle-seasoned instructors conducted the training of student officers in the techniques of combat flying and fighting, and also grooming air and ground crewmen. Many of the "greats" of naval aviation received their operational training at NAS Jacksonville. Many of the outstanding airmen were brought back from combat and gave Navy and Marine pilots and air crewmen their final training for the Fleet. They served as instructors at gunnery schools, technical training centers and operational training units, where crews of dive bombers, torpedo bombers, scouts, patrol planes and heavy bombers were welded into combat teams. The main supply of pilots was funneled through NAOTC to the Fleet. The Command turned out naval aviators and air crewmen in the quantity and quality the Fleet required, and they were schooled in the tactics and combat maneuvers demanded by carrier warfare. Jacksonville and its other subordinate stations handled all phases of carrier and shore-based operations training. Fighter pilots underwent instruction at Jacksonville, Green Cove Springs, Daytona Beach, Melbourne and Sanford, Florida. 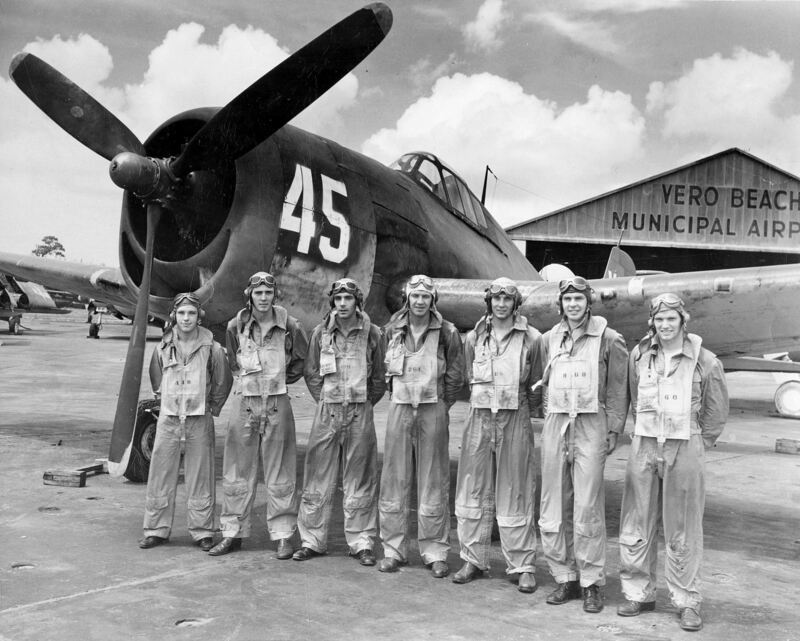 Night fighter pilots trained at Vero Beach; dive bombers pilots at Cecil Field, Miami and DeLand; and torpedo bombers at Fort Lauderdale and Miami, Florida. Dive bombing and torpedo bombing practice eventually stopped at Jacksonville's Switzerland Field OLF when a pilot almost bombed the east end of the Shands Bridge at Green Cove Springs by mistake. Most pilots picked for carrier service took carrier qualification tests at NAS Glenview after completing operational syllabus and just before departing for the Fleet. Multi-engined, multi-place aircraft pilots and crews trained at other facilities in Florida. Newly commissioned Naval Aviators arrived at Jacksonville, after completing intermediate flight training, from stations such as NATC Pensacola. Operational flight training was performed in combat-type aircraft. Typical CV (carrier fighter) aircraft included Grumman F4F, or General Motors FM-2 Wildcat; Grumman F6F Hellcat; Vought F4U, or Goodyear FG Corsair. The CV (carrier fighter) bound aviator, before assignment to a fleet carrier squadron, was required to demonstrate their mastery of taking off from and landing aboard a floating airfield. All pilots trained intensively in the use of primary weapons on the ground and in the air. They were schooled to meet actual combat situations at Jacksonville. There was no simulation, except the young pilots and air crewmen aimed at dummy targets instead of an actual enemy. The .50 caliber fixed guns fired were the same as those used in actual combat. SBD and PV type aircraft dropped bombs on moving water targets. TBF's and TBM's made torpedo drops on target vessels. Pilots were trained in tactics of combat. Navigation, communications, how to report enemy positions and respond to orders from fighter directors were greatly emphasized in training. Understanding weather, how to avoid its perils and use it to tactical advantage, along with night flying were also covered. Pilots were expected to learn to fly instinctively, to do the right thing at the right time without conscious thought or effort. This was the transition stage during which student officers become combat pilots. 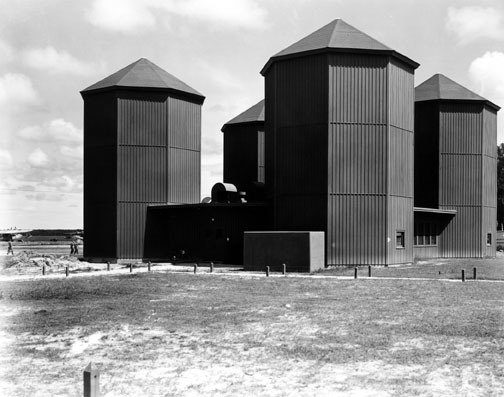 The building for the Link Celestial Navigation Trainer housed four simulators at Jacksonville. Fighter pilots practiced single-plane combat with the Gun Air instructor which drills in maneuvering correctly and aiming accurately. The Link Celestial Navigation Trainer enabled learners to navigate by the stars without leaving the ground; Link Instrument Trainer continued the instrument training that cadets underwent in intermediate flight training. Ground school was anything but academic in operational training. Student officers focused only on subjects that had direct bearing on their operations with the Fleet. They continued to study navigation so they could locate a target, regardless of weather conditions, and find their mobile airports after shoving off for duty in combat zones. They went deeper into recognition training of friendly ships and aircraft verses enemy ones. Student officers practiced communications using equipment employed in the Fleet and simulate its use in combat. Communications practice dealt with correct procedure for sending a contact report and used fighter director's code in reports, and for practice use in conversation. 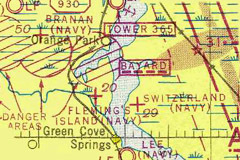 Aeronautical chart showing OLFs Branan, Fleming's, Green Cove Springs, and Switzerland fields where FCLP too place in mid-1940s. 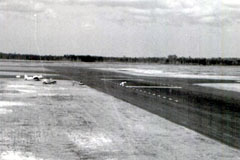 Jacksonville's nearby NAAS Fleming Island Field in 1943, with aircraft lined up for practice. Pilots had to land their planes inside the rectangle. Landing Signal Officers (LSO) were positioned on the port-aft corner of the aircraft carrier. Lee Field, NAAS Green Cove Springs, on 4/3/1944, is another satellite of NAS Jacksonville where CV pilots practiced carrier approaches on land before qualifying on a "floating airfield." 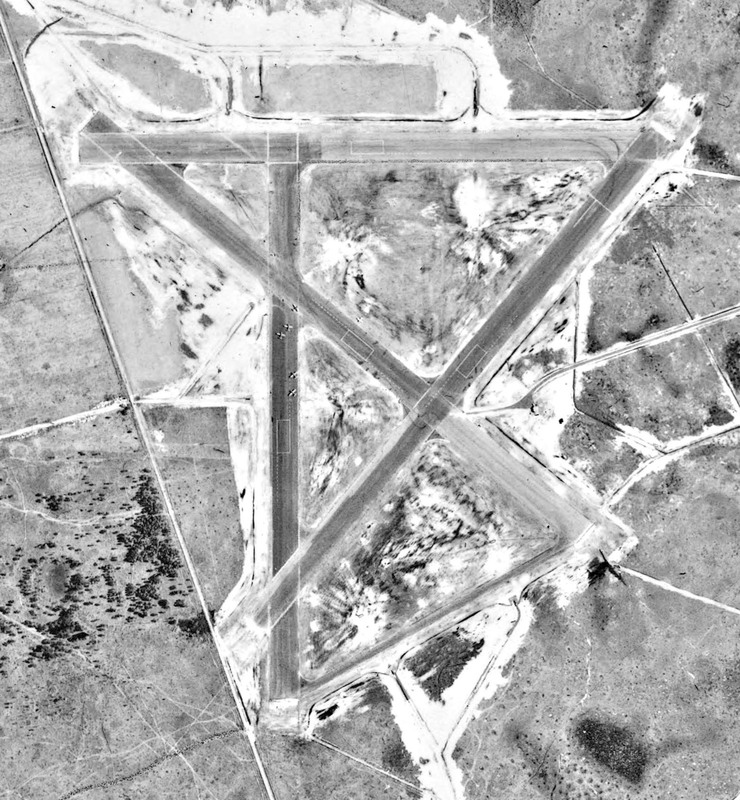 The rectangular markings on runway represent the deck of an aircraft carrier. Photo taken shows a LSO using paddles to guide pilots who must land perfectly within the rectangular box. Operational Training and Field Carrier Landing Practice at NAAS Green Cove Springs. Good example of Naval Aviators during Operational Training with Grumman F6F Hellcat fighter in 1944 - albeit a different base at NAS Vero Beach, FL. Condition of plane is rough as many were relegated from combat to OT for pilot trainees to experience FCLP in front line aircraft. Before pilots can actually land aboard aircraft carriers, they have to practice on a shore-based airfield. Field carrier landing practices are a series of touch-and-goes (on land) which are observed by a landing signal officer (LSO) who grades and critiques each landing. The hard-surface runways were painted to resemble the deck of an aircraft carrier. Trainee pilots were judged on their ability to plop the aircraft down at the proper spot to catch the carrier’s arresting wires. 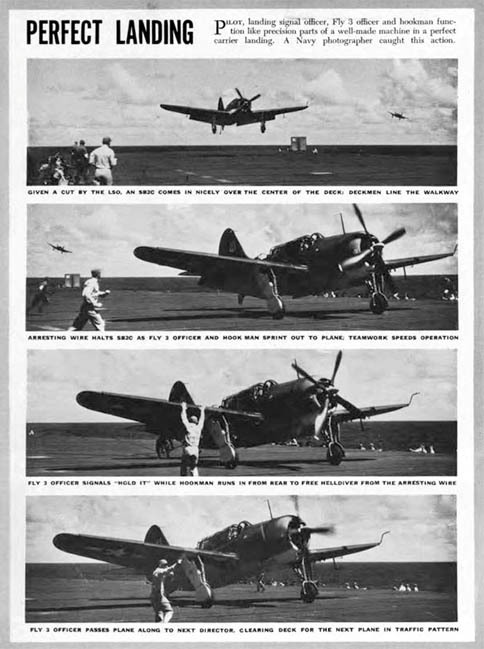 The Navy taught "full stall" landings, as opposed to guiding the plane to a gentle, smooth landing. The goal for the fledgling carrier pilot was to have the aircraft run out of lift just above the flight deck at the right spot, cut power and "crunch" solidly onto the deck. This landing technique can be described as a kind of controlled crash. After a few months of operational flight training, FCLP was the last installment of training at NAS Jacksonville. Those who succeeded were sent to the Carrier Qualification Training Unit at NAS Glenview, Illinois. CQ was the final stage of all operational flight training for Navy pilots before combat service. It is likely that Ed Scharch practiced carrier approaches on land with the F4U Corsair, or the F6F Hellcat, at one of the nearby airfields such as NAAS Green Cove Springs (Lee Field), or its outlying landing fields at NOLF Branan Field, NOLF Fleming's Field, or NOLF Switzerland Field. These remote airfields were all part of the greater NAS Jacksonville complex and set up to provide Field Carrier Landing Practice. 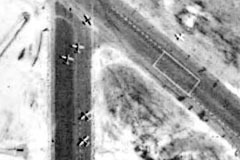 The runways had rectangular markings (about 100 ft long) representing the landing area on the ramp of an aircraft carrier where the arresting wires were positioned to trap the plane. 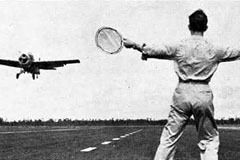 Following this Field Carrier Landing Practice training the students were sent to a Carrier Qualification Training Unit at NAS Glenview, Illinois. Using the available training carriers, USS Wolverine and the USS Sable, qualifying took place in the submarine-free waters of Lake Michigan. The prospective carrier pilot performed the required number of take offs and landings (eight) to be certified as carrier qualified. Pilots were then assigned to operational squadrons. 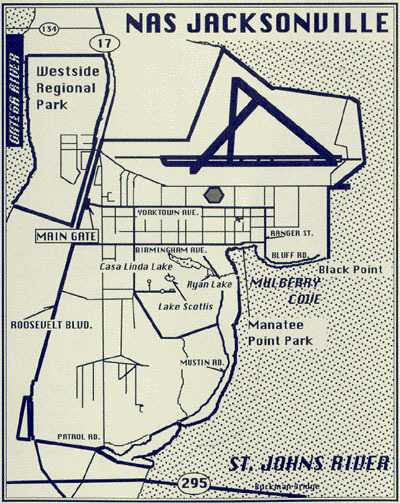 Commissioned as NAAS Green Cove Springs in February 1943, the auxiliary continued to be known as Lee Field. Aircraft checkout and carrier qualifications using F4F Wildcats and F4U Corsairs began in May 1943. Outlying fields used were at St. Augustine, Switzerland, and Fleming Island with gunnery flights operated from Palatka. The station complement numbered over 2,000 officers and men in March 1944. 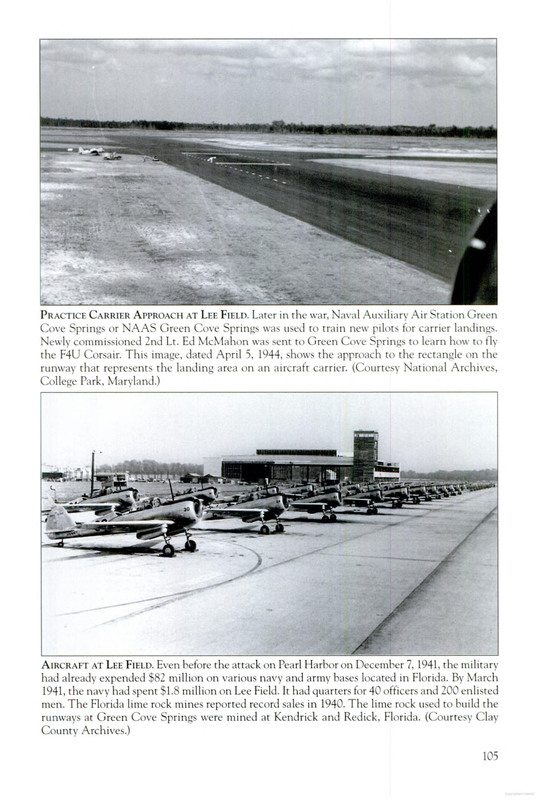 In early 1945, a newly commissioned (USMC) 2nd Lt. Ed McMahon arrived at Lee Field, Green Cove Springs, FL to learn how to fly the F4U Corsair for operational training and learned FCLP. McMahon later became famous for his work on television as a pitchman and sidekick on The Tonight Show Starring Johnny Carson. Naval Air Station Jacksonville was officially commissioned on October 15, 1940, and it became the first part of the Naval Air Operational Training Command complex, that included NAAS Cecil Field and Naval Station Mayport. Captain Charles P. Mason raised his pennant as the station's first commanding officer. Prior to the commissioning, on Sept. 7, 1941 Cmdr. Jimmy Grant became the first pilot to land on the still unfinished runway in his N3N-3 biplane. More than 10,000 pilots and 11,000 air crewmen followed their lead to earn the wings of gold at the station during World War II. Increased training and construction characterized Jacksonville’s response to America’s entry into World War II. Three runways over 6,000 feet long were operating, as were seaplane ramps. Overhaul and Repair facilities were built to rework the station's planes. More than 700 buildings sprung to life on the base before V-J (Victory over Japan) Day, including an 80-acre hospital and a prisoner-of-war compound which housed more than 1,500 German prisoners of war. Archbishop (later Cardinal) Francis J. Spellman dedicated St. Edward's Catholic Chapel at its Birmingham Avenue location on Jan. 17, 1943. The chapel and other buildings constructed during the war years, intended for a life of only 20 years, are still in use. By October 1, 1944, some 6,338 operational training students had been received with 4,798 graduating. Operational training was not without its dangerous side, as there were 58 fatalities recorded in the first 29 months of operation. 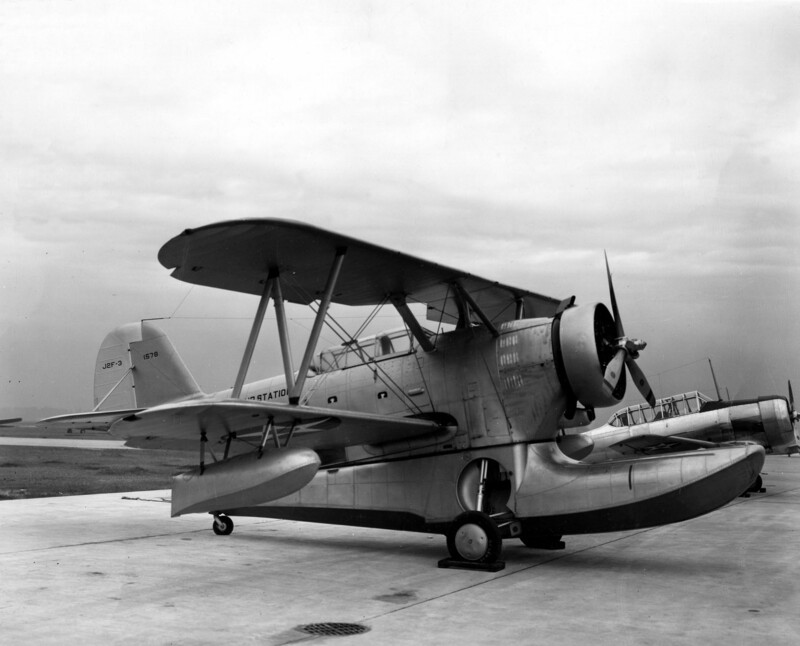 The first aircraft assigned to NAS Jacksonville was this Grumman J2F-3 Duck (BuNo 1578), which arrived on 16 January 1940. This aircraft would remain as the Commanding Officer's plane. 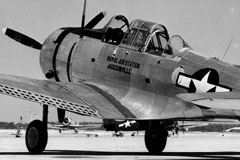 Douglass SBD-5 Dauntless scout/dive bomber with distinctive perforated split flaps or "dive-brakes" was another carrier-borne combat plane used for operational training at NAOTC Jacksonville. 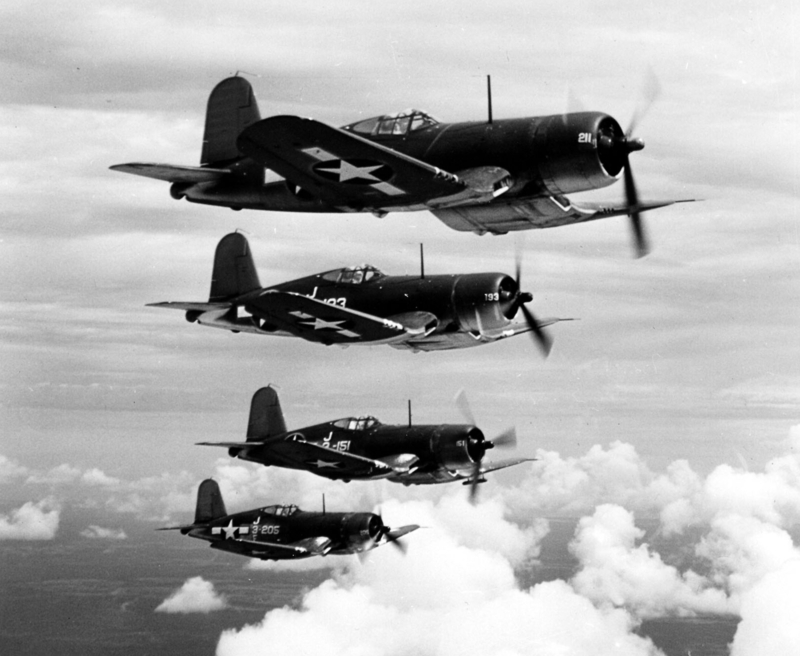 Vought F4U-1 Corsair fighters over NAS Jacksonville, Florida in 1944 used for operational flight training, also served as a combat fighter. 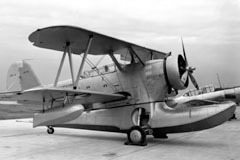 Jan. 16, 1940 First aircraft assigned to station, a Grumman J2F-3, arrives in NAS Jacksonville. Oct. 15, 1940 NAS Jacksonville commissioned at high noon. Capt. Charles Perry Mason first commanding officer. Training Squadron VN-13, D-7 established. Admiral John Towers in attendance. Dec. 24, 1940 Station’s first training aircraft arrive as 10 N2S Stearmans fly in direct from the factory in St. Louis. Jan. 2, 1941 First primary training squadron, VN-11, commissioned. March 5, 1941 Seaplane squadrons VN-14 and VN-15 established, using nine P2Ys and P2Y-3s aircraft. June 24, 1941 First class of aviation cadets receives their wings (Ensigns Hemphill, Kennedy and Shortlidge). Aug. 15, 1941 First major aircraft overhaul completed at the Assembly and Repair (A&R) shops with completion of N2S Stearman No. 3423. Sept. 20, 1941 Officers' Club dedicated. May 1, 1942 Rear Adm. A.B. Cook became the Chief of Naval Air Operational Training Command with headquarters at NAS Jacksonville. May 24, 1942 Station flies 254 aircraft at one time as a demonstration of air power for visiting Pan-American officials. Aug. 28, 1942 Aviation Free Gunnery School commissioned near Cecil Field. Oct. 15, 1942 Operational Training began with PBY sea planes as VPB2 (Patrol Bomber) OTU (Outgoing Training Unit) No. 1 is established and training squadron VN-15 disestablished. First aircraft turrets arrive (.30 and .50 caliber) at Gunners School. Feb. 20, 1943 Training Squadron VN-14 became Observation Squadron VO-VCS and began operational training with OS2U Kingfisher aircraft which included catapult practice. April 1943 Lt. Cmdr. Charles Henri de Levis Mirepoix succeeded Lieutenant Andre Gilbert as Commanding Officer of the Fighting French Naval Aviation Unit at NAS Jacksonville. 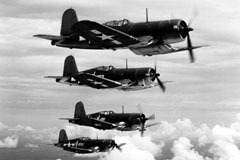 Oct. 26, 1943 VF (fighter aircraft) training begins in the F4U Corsair. March 10, 1944 Two SNB twin-engine aircraft assigned and the multi-engine phase of instruction inaugurated. July 18, 1944 First arrested landing on airfield. Sept. 10, 1944 NAS Jacksonville pilots achieved more than 1-million hours of flying time. Nov. 28, 1944 First helicopter lands at station (Sikorsky HNS). 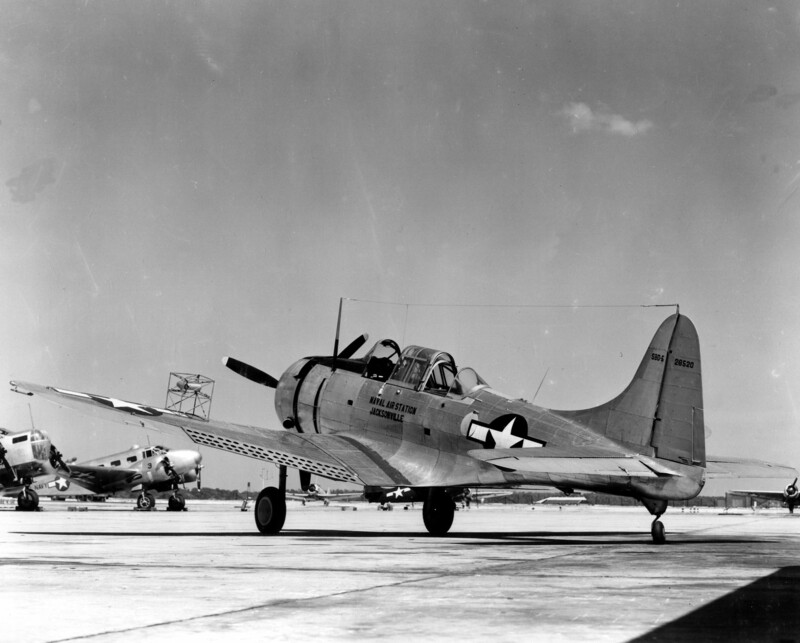 Dec. 22, 1944 MF-OTU, first all-Marine Fighter Squadron aboard NAS Jacksonville established. Aug. 31, 1945 Navy Separation Center Commissioning Ceremony held. Thousands of Sailors would be discharged from the Navy before the center was closed. 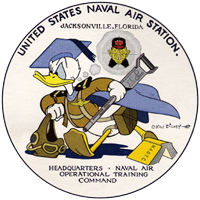 Artists from Disney Studios created at least seven different insignia designs for units that were either stationed, or received training at Naval Air Station Jacksonville, Florida. Six of those designs were created during World War II. Here are three. The station's first design featured a flying squirrel. The station's second design featured Donald Duck in a split airborne eggshell, which represented the station's role at war's outset - that of a primary training school. 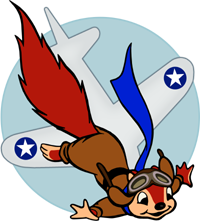 First station insignia "Flying Squirrel" was created by Disney artist Roy Williams and used by NAS Jacksonville 1940-1941, for their Primary flight training program. 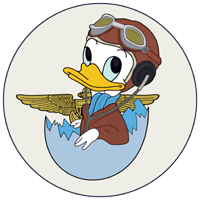 Second station insignia was first to feature Donald Duck in "split airborne eggshell." New Disney design replaced station's flying squirrel mascot in March 1941, for their Primary flight school. Third Disney-designed insignia adopted when NAS Jacksonville was redesignated Headquarters of Naval Air Operational Training Command in June 1943. "Donald Duck, the Station's mascot on the old insignia used in the days when aviation cadets trained here, is still the mascot on the new emblem, but he's a changed man. Donald...is a belligerent chap with a grim-visage and a bellicose glint in his eye that bodes no good for the Axis. Machine gun in hand, cloaked in the cap and gown of a graduate flier with ensign's stripe on his shoulder boards and a vision of Hirohito in his gun-sight, Donald will make his debut on the Station soon. The revamped Station insignia...illustrates the change of activity here...as Headquarters for Naval and Marine commissioned officers operational training, the station now sports the fastest and deadliest Navy planes and most skilled instructors in the world. Many of the earlier cadets who first sprouted wings here have won their spurs in action on the world’s battle map. Vice-Admiral Aubrey W. Fitch, Commander Aircraft, South Pacific, recently cabled as follows: 'Operational trained Navy and Marine Corps pilots arriving this area are demonstrating a high order of ability as combat pilots.'" 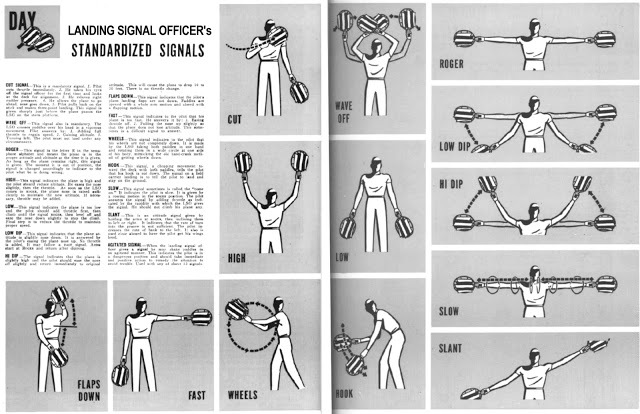 A 52-page booklet was published for base civilian employees in 1945. This design also appears on several different matchbooks and stationary. 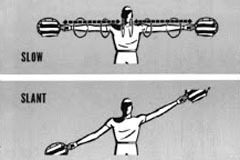 As an interesting side note, the illustrations found inside the JAX booklet were originally created for a 1943 Disney new employees booklet called, "the Ropes at Disney's.